Monday morning found a poor black horse in the drop pen. Sunday we had someone call and ask about bringing in a horse after hours, and we told them that the after hours surrender pen would be available. 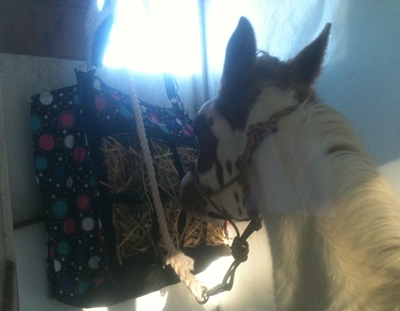 Tawnee asked them to leave some information about the horse, but none was found with the horse. 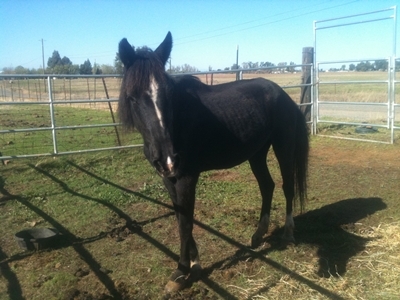 From what Tawnee could gather from the phone call, Animal Control told them about our euthanasia program because this horse has a hole in her heart and her health is beginning to fail her. We will have our vet check her out to see what her opinion is. The horses all enjoyed their breakfast. 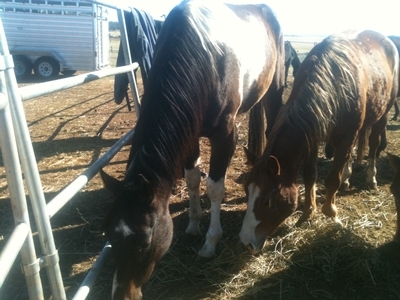 We were told at the staging area the pipeline horses were only eating almond and walnut shells. What a diet, no doubt they enjoy nice yummy hay a lot better. The pretty Palomino looked like gold in the morning sunlight. She got so shiny after her bath! 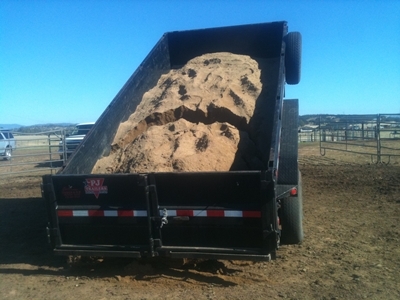 We had been needing to get sand in the round pen for a very long time now, and we had an offer of donated sand, but due to the distance, it was cheaper to buy some from the local quarry 10 minutes away for $10 a ton. 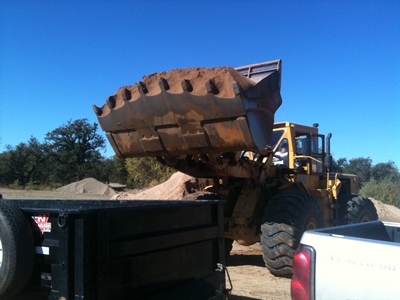 One of our board members loaned us his dump trailer to get some sand moved. …and out it came. 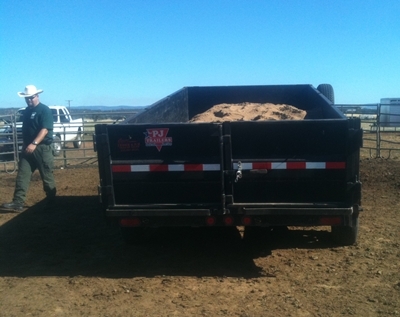 We are so thankful it is a good working dump trailer and we didn’t have to unload it by hand. Today was Ballena and Blossom’s luck day. Many of you may have noticed they were taken off the available page. Their previous owner, who’s animals were seized by Animal Control due to abuse, came out to the shelter looking for his horses. He claimed to be someone else, and tried to buy Blossom and Ballena on the spot for $500 cash. 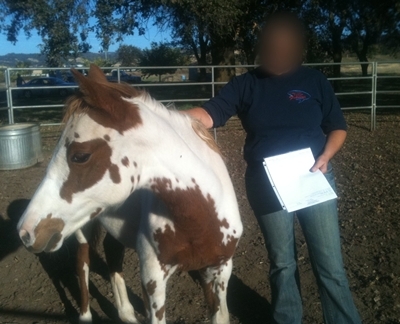 Of course that is not the way to adopt a horse from any legitimate rescue or shelter. Tawnee was extremely skeptical of this individual and told him our adoption approval process (including checking with Animal Control to see if there are any prior animal abuse convictions) and so on. He finally left and was positively identified thanks to our security cameras that he was the previous owner. Ballena and Blossom had to be moved from the shelter right after he left for their safety. They had been in the horsey ‘witness protection program’ ever since. 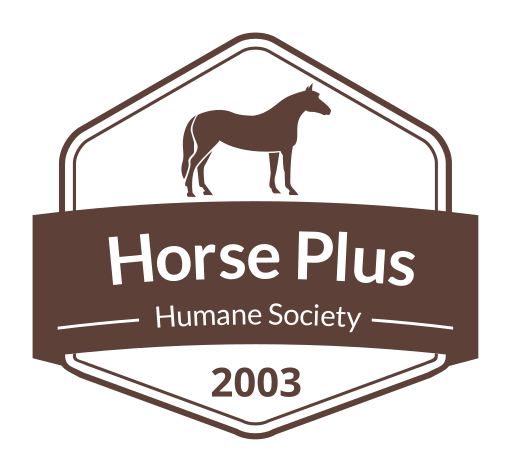 It is much harder to find homes for horses when they cannot be on our website, and we were extremely thankful when one of our previous adopters stepped forward to give Blossom and Ballena such a great home. 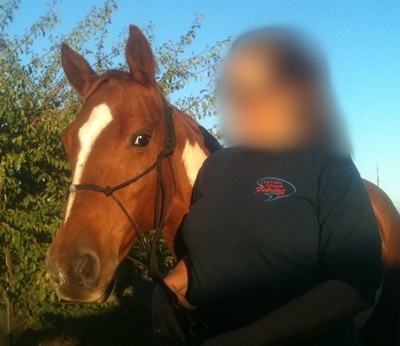 Due to adopters security issues, we have blurred her face for her safety and her horses safety. Ballena loaded right up into the trailer, happy as can be. Check out the neat looking hay feeder. It is definitely very stylish. Blossom was at a different location, so they headed over to load her up too. She is such a pretty girl and we are so thankful that both Ballena and Blossom will have such a wonderful forever home. Keep the votes up! We are still in 3rd place for California. 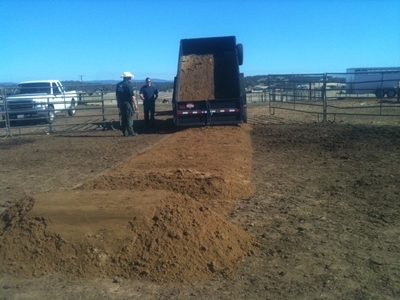 Remember it is still under our old name, NorCal Equine Rescue. To vote today, Click here. We are currently behind on phone messages and emails, ever since the slaughter bound horses came in, we have been so busy taking care of them. The horses welfare comes before phone messages and emails, please bare with us! Thank you for your support both emotionally and financially. It really helps! Your blogs are always so enlightening and interesting and sometime almost too sad to read, … I would never miss a day. But I did miss seeing a big DONATE HERE button on the email. That’s something that’s very helpful for people like lazy me. Also wouldn’t miss a day to vote for you. God bless you and your work. Awesome. We will get that DONATE button in there! 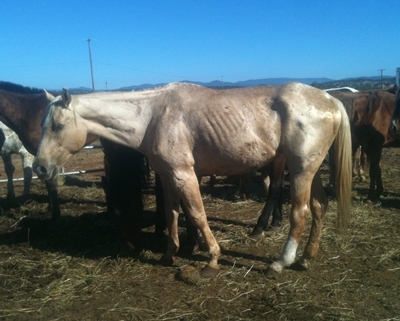 We lost 2 horses from the last group they were very weak, but at least they knew that someone cared.